He opens the door of the apart-hotel where he’ll be staying with his partners Mark Turner and Jeff Ballard. Fly is on a tour in Spain and the first stop is Valencia’s well-known Jimmy Glass Jazz Bar. Larry Grenadier looks relaxed and he says hello naturally. He is dressed as though for a day at home: barefoot, and in casual clothes. He looks younger than in the promo pictures and less serious than when he is on a stage, wearing his glasses behind a bass. He has a funny smile drawn on his lively face. Grenadier makes an effort to always provide options to all musicians sharing the stage with him, always striving to let them grow on their own. He tries to make the music move forward, and this, for him, is an unequivocal priority. Every time, he focuses on expressing himself as clearly as possible, so that his fellow musicians can feel comfortable and react accordingly. And this is what sets Fly apart from the rest of the pack: their music feels open. 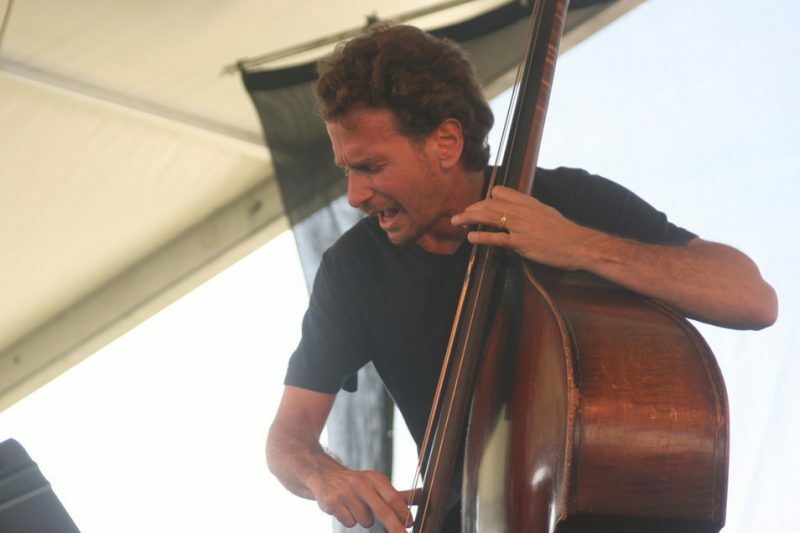 Today, Larry Grenadier is regarded as one of the most accomplished jazz bass players in the world. He couldn’t have imagined that when he started playing the trumpet when he was a little kid, and he couldn’t have imagined it either when he started playing the electric bass in a band with his brothers. Many years have passed. Now he’s older, but his face still retains the smile and the happy blue eyes of the child he once was. If you had to choose an artist whose work has inspired you from the very beginning, who would it be? I was listening to everybody. I liked Miles Davis a lot so I almost listened to all the bass players playing with Miles. It’s hard for me to say. The first bass player I listened to in a concert was Ray Brown. That was very powerful for me because it was in a really small club. And I was sitting here, and Ray Brown was there [really close]. And to see him and hear him, it was really, really, powerful. So I would probably say Ray Brown. You were just 18 years old when you first played with Joe Henderson. How did you feel? Were you intimidated? I think I was too young to be very intimidated, as I should [laughs]. So for me it was like, “OK, OK, let’s do it!” I played with him and it was very fun. I was very lucky because I could play with great people, being very young. There weren’t too many bass players in San Francisco, so I got to play with people that, if I was in New York, I wouldn’t. It was a nice time; people used to come there without bands so it was great for me to learn. I was very fortunate. Gary Burton also called you to play with him during that time. Yes, I knew the saxophone player that was playing with Gary. He was a friend of mine, and my friend asked me to play with him. I had just finished college and I had wanted to move to that in direction anyhow, it was just the right time then. So it was great, my first touring! You have played with some of the most important jazz musicians. Do you feel the weight of this artistic responsibility on your shoulders? Sure, definitely. In general, the bass’ role in music is to make everybody’s sound as good as possible. So I take that responsibility, for sure. I want to be able to give music whatever I think it needs and to make that experience feel better. Playing with Pat Metheny was a significant learning experience for you, wasn’t it? It’s always a learning experience to play with everybody. He’s totally immersed in music; he’s completely given himself to searching the musical world and I think it’s very inspiring. I have played a lot with him so you can get to know somebody in a deeper place and you can participate in that. Those concerts showed me what I want to work on. Those experiences are very helpful in many ways. It’s great. 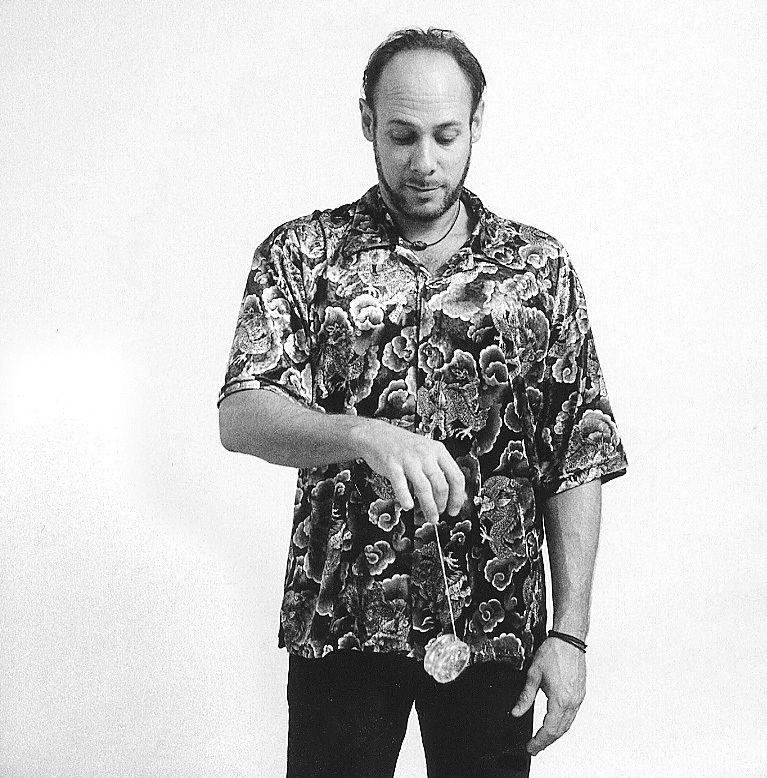 You played for a long time with the Brad Mehldau trio. Looking back, how do you remember those days? We had a really good time. It was a long time ago so I don’t know if we would have the same experiences now. But we had a great time! And musically, when we started playing we got along in a nice way; we shared values about music. That’s another fortunate case because we played so much together that we had to grow into something better. So we really had the chance. You say you like musicians you can recognize by listening to just one phrase. Do you think you are one of them? I don’t think about that, but probably. The history of jazz is all about personalities, about their sound and a certain way to play. It’s not that I try to do that, but I think that, with time, you develop a certain style to play. Then I guess people who listen and know my way can say, “Oh, yes, this is Larry.” But I don’t know… it’s hard for me to say. I’ve always appreciated those players [who you can recognize immediately]. Charlie Parker was. Brad Mehldau has that, Pat Metheny, John Scofield … All great musicians have that. It’s a strong personality. What’s the balance in music between intellect and soul? It’s a good question. We were talking about this last night, Jeff [Ballard], Mark [Turner] and me, [about how] it’s too easy to over-intellectualize everything and also the way jazz is taught now at schools. So we have to verbalize at first and then play the instrument and see what’s going on. This is an intellectual process. But for me, what I learned wasn’t like that. It was like, you listened to something and you tried to play it, pretty intuitive … so I think [in] my favorite music, [within the] intellectual process another thing happens that makes the music work, and it’s pure. With a really good technique you can express yourself but the way to make contact is not about technique, it’s about emotion. So in a way, the ultimate music experience is zero intellect, but you know that without the intellect you cannot move on with all the process. 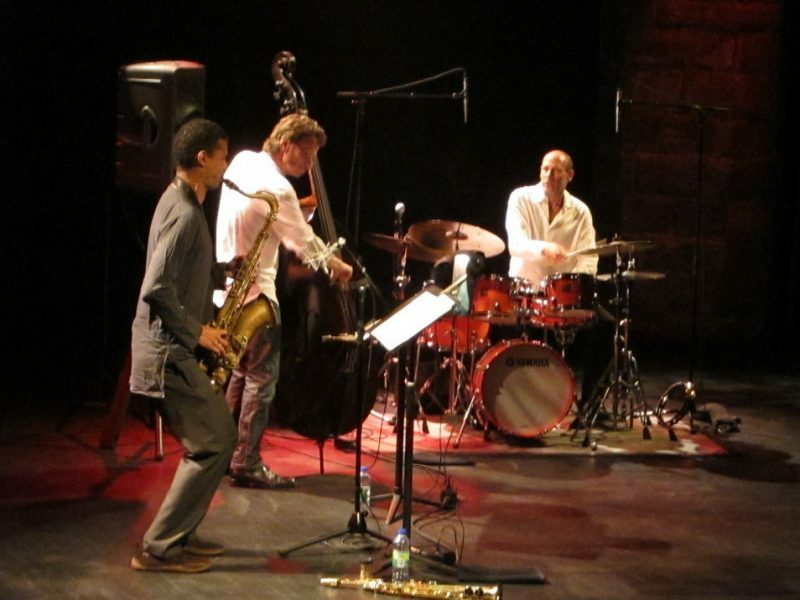 You have shared many hours on stage with Paul Motian, who sadly left us a few months ago. How would you describe that experience? Oh, man, he was such an influence for almost every drummer since him, especially for my generation’s drummers. He’s a huge influence. He was one of the guys where you heard two phrases and you said, “Oh, it’s Paul Motian.” He was also a guy who was completely modern in every way but also completely traditional. He proved to me that you can have the whole history of music when you play now. He was, like, ahead of time. Super great. We got to play a lot in many different situations. He was one of the guys of that generation who didn’t say too much about the music; probably that everything would pretty much be discussed through the music. And that’s unique in that era of musicians. It was a great learning process playing with Paul. Super easy. It wasn’t hard to play with him. It’s a real loss for music. He had such a strong presence in New York. It seems like a significant part of your inspiration comes from drummers. Would you say that in a certain way you try to translate their language into your own instrument? Well, we are doing more or less the same thing; we play time and we try to make the music feel good, so I can feel that everything the drummer does is the same thing we do on bass. So, definitely, I think about drummers to figure out how to approach music. And how are your composition chops? [Laughs] This is the good thing about this group, Fly. It forces me to write music specifically for this band and figure out the different ways to make different experiences with sound, make it unique and bigger. It’s different. It’s great. But composing for me came much later than playing. And I’m not totally sure why, I think it was because I was always playing with different people, and never knew what it was like to have a band or something. Maybe only in the last 10 years I started focusing on that but I still have to force myself to do it. So do you have in mind an album as a leader? I have ideas. People ask me but I haven’t felt strongly moved to do it, because I’m satisfied playing in the groups where I have played and I feel free to express myself completely. But sure, at some point I have to!